BUFFALO, N.Y. (AP) — They got hitched while still in their teens, divorced 20 years and four children later, and are getting remarried after nearly a half-century apart. 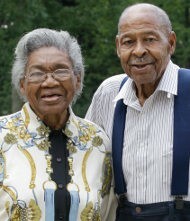 For Lena Henderson and Roland Davis, both 85 years old, the second time around is finally here. The couple plans to get married again on Saturday, with four generations on hand to see it happen. “It’s every child’s dream, every child who has ever been in a family where divorce has occurred, that your parents would come back together,” their youngest daughter, Renita Chadwick, said Tuesday as wedding preparations were in full swing. “We are all so ridiculously excited. We’re like little children again,” said Chadwick, herself a grandmother. Henderson and Davis met as teenagers in Chattanooga, Tenn., and were married by a justice of the peace. There was no reception or honeymoon. “Oh no,” Henderson recalled with a laugh. “He went to work and I went home.” Davis was a hotel bellhop at the time, about to begin a career in the military. This time around, a church wedding is planned, at Elim Christian Fellowship Church in Buffalo, followed by a reception at an Amherst restaurant. Still no honeymoon trip, though. “I’m just happy that we’re here,” said Davis, who recently moved to suburban Buffalo from Colorado, where he was living alone following the death of his second wife in January. Henderson also was widowed after re-marrying. Davis proposed to Henderson over the phone around Easter and she accepted, even though they hadn’t seen each other since a family funeral in 1996. Before that, the two hadn’t been face-to-face since splitting up in 1964, though they had stayed in touch and kept up with each other’s lives through the children. Their oldest daughter, Johnnie Mae Funderbirk, had been urging her father to return to New York since his wife’s death. Davis was receptive, especially to the idea of reconnecting with Henderson. Henderson and Davis both said it was “nice” to see one another again, this time as an engaged couple. The children are less reserved. Posted on August 1, 2012, in So Random! and tagged Buffalo, current events, Lena Henderson, New York, Roland Davis, so random, Wedding. Bookmark the permalink. Leave a comment.